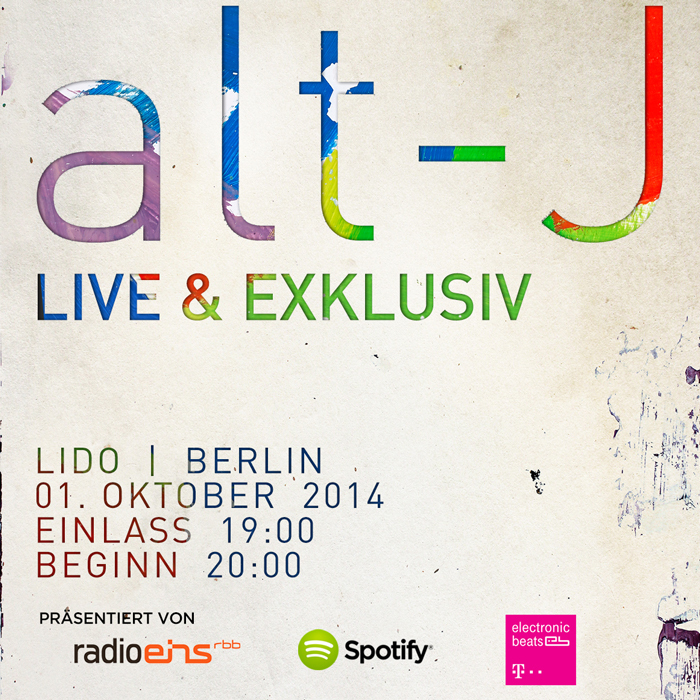 Win Tickets to see EB Presents Alt-J in Berlin! Update: The contest is now over! We’ll be selecting and contacting winners throughout the day, so keep an eye on your inbox. If you don’t hear from us, we’re truly sorry, but we hope to see you at the show anyway. There’s only one week left until the release of Alt-J’s latest album, This Is All Yours, and our thirst has never been stronger. The British band has been drip-feeding singles and videos from the LP all summer, including the Cyrus-sampling “Hunger of the Pine” and the gendered videos for “Every Other Freckle,” which we’ve included below, along with the Spotify stream of the album itself. Now that our excitement has reached a fever pitch, it seems like a perfectly fitting time to announce that we’re hosting an Alt-J live set on October 1 at Lido in Berlin, and we’re giving away 50×2 free tickets to the event. The raffle starts today and ends on the 22—the day before the album drops—and you can enter using the form below. And if you’re not in Berlin, fear not—we’ll be recording the set for EB.TV.